27 HP increase, 10 extra foot pounds of torque increase. 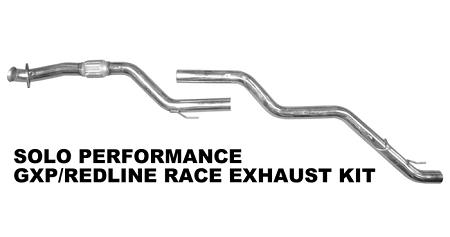 The GXP-Race exhaust system was developed primarily for the Auto Cross and other racers out there. 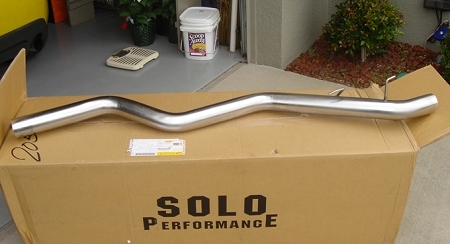 It’s a full 3” polished mandrel bent single exhaust system that exits only on the driver’s side. It’s a no frills, light weight, no muffler exhaust kit designed for the enthusiastic racer. 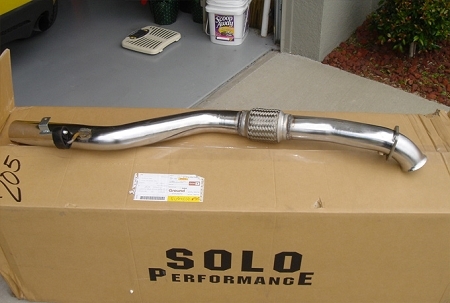 • Solo’s loudest exhaust kit for the turbo GXP. • Fully polished stainless steel cat back exhaust kit. • Includes all necessary hardware for installation. • Classed as a full bodied nosier exhaust kit. • Recommended for the enthusiast. • This is a no drone exhaust kit with no muffler. • This is a single exhaust. • 3” mandrel bent polished stainless steel. • Laser cut stainless steel flange. • Extra hanger included for support. • Heavy duty double braided flex pipe is used. • A very precise hand made flare is on the front pipe to alleviate having to reduce the pipe to 2 ½”. • The front pipe mates to the stock 2 ½” catalytic converter or our full 3” free flow converter. • There is no muffler or tip on this kit. 438 points will be rewarded to you when you buy this item.